Students admitted at SMC&H are not cases of AEFI of Measles Rubella vaccine- DIO, Hailakandi. District Immunization Officer (DIO), Dr.K.Thambalsena said the students admitted at Silchar Medical College and Hospital (SMC&H) are not cases of adverse events following immunization (AEFI) of Measles Rubella vaccine. 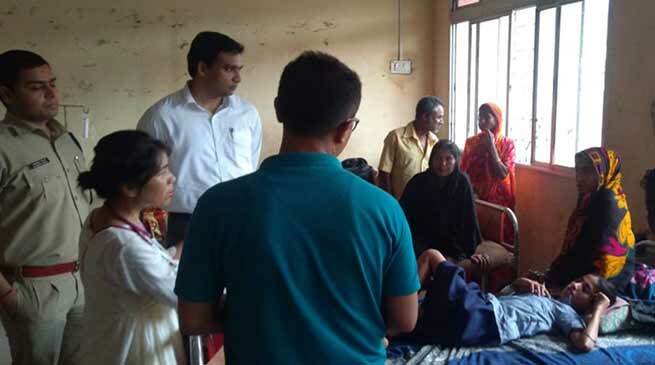 DIO, Dr.Thambalsena said the condition of the two students of Sahabad ME Madrassa is quite stable and medical reports have proved that they have not been affected at all by MR vaccine. “The students admitted at the medical hospital are not AEFI cases related to MR vaccine but those affected by hysteria and fear of being pricked by needle,” she added. The DIO informed that the two students who are undergoing treatment at the hospital are doing well and would be released today. Dr. Thambalsena stated that there were no fresh cases and all the students that were under observations at Katlicherra Block PHC have been discharged. Deputy Commissioner Adil Khan and Superintendent of Police, Mohneesh Mishra visited the SMC&H on Tuesday and took stock of the health condition of the students. Khan requested the doctors to provide the best of medical care and treatment to them. Meanwhile, the health authorities have geared up reorientation programmes involving ANMs, ASHA supervisors, AWWs and nodal teachers, parents-teachers’ meetings and community meetings across the district. MLA, Katlicherra, Suzamuddin Laskar has appealed to the people of his constituency and the district as a whole for getting the children immunized for ensuring their healthy future. As many as 2.15 lakh children in the district will be covered under the MR vaccination drive.